Earlier in the week I cut up one of those collages and have got a pile of potential postcards! 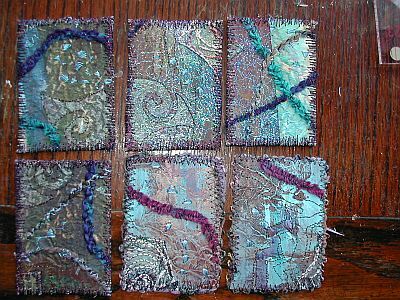 But I also made some ATCs – Artists’ Trading Cards, for Dale’s swap. Here they are. I’ve never made ATCs before. I think I prefer postcards – the ATCs were a little too small for me. Small……but lovely, Liz. Isn’t it interesting how our style comes out even in tiny pieces? These are lovely Liz. beautiful colours. I hope the toothache is easing with the antibiotics. These are wonderful! I’m working on some for trading. Let me know if you’d like to trade with an Alaska quilter. I am trying to gather enough from around the world to border my design wall with them. I have a long way to go! Previous PostPrevious Makalu Yarns silk!